We are pleased to announce that Prime Marine has received the 2018 GREEN4SEA Tanker Operator Award at a prestigious awards ceremony which successfully concluded on March the 6th at the Yacht Club of Greece in Athens, the evening ahead of the GREEN4SEA Conference. Prime Marine received the 2018 GREEN4SEA Tanker Operator Award, sponsored by ABS, for its various initiatives towards GHG emissions reductions, becoming the first shipping company globally that received from ABS the Assessment letter of a Monitoring Plan for Compliance with the EU MRV Regulation, prepared for vessel M/T Emerald Shiner. Other short-listed nominees for this category were: AET Tankers, SCF Group, Teekay and Waterfront Shipping. Prime Marine specializes in shipping oil refined products, including a variety of other liquid products, LPG and Ammonia anywhere in the world in a safe, timely and reliable manner. PRIME’s management team has more than eighty years of combined industry experience having been through a number of cycles. The company’s efforts to sustainability are not limited only to vessel’s performance but also extend to company’s office environmental performance. Being member of Green Angels, Prime became the first shipping company that completes successfully the ISO 14064-1:2012 Verification regarding the GHG emissions (CO2equivalent) related to Office operations. Prime Marine attracted the most votes by the end of the voting period which held online during a 30-days period. 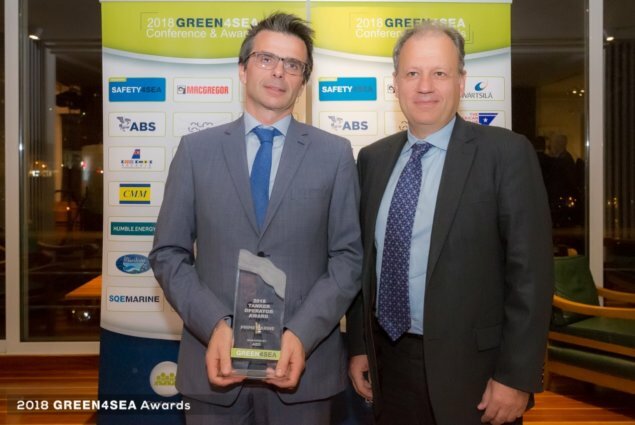 GREEN4SEA Conference & Awards within the scope of awarding environmental excellence and performance above average in any aspect of maritime activity. Copyright (c) 2019 Prime. All rights reserved.